The Variable Data Printing (VDP) process allows a set of unique variable labels to integrate seamlessly with product identifying sticker labels. Examples include variable decals, variable data printing, custom QR code labels and numbered decals. Variable printing is also an efficient and powerful tool for the automatic placement of unique, variable images on individual labels. The biggest advantage of this printing VDP solution is that every label processed this way can be unique. This allows for the businesses to have printing done for consecutive numbers, text, barcodes, and even graphics, dynamic numbering, and messages. You have a choice of variable data printing done with short runs and low minimums. We’re happy to accommodate businesses and individuals that require white color numbers printing on clear labels. Variable data personalization adds promotional codes, letter sequences, names, and addresses to all printed items. When placing unique images on labels, one can give each image its own barcode, QR code, or number field right on the label names itself. 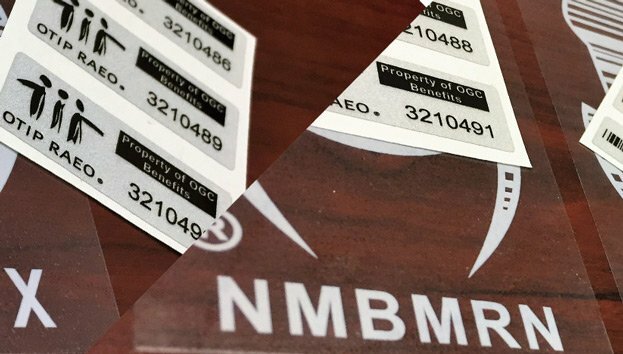 Whether you’re printing serial number labels, 2D Code (Data Matrix), QR codes, barcode tracking labels, parking decals, employee or student ID card stickers, or product labels with lot numbers and date coding — Multicolor Labels handles all these applications more with ease, thanks to our digital labels printing process. With our advanced digital printing technology, every component of your variable data printing label can be printed in full color, with unique images for human readable content, personalized marketing and global tracking logistics JIT systems. All you need to do is provide us with your variable data fields — your artwork and the various pieces of data you want on your label — and we’ll take care of the rest, including custom, intricate CNC cut-outs if required. Variable data printing lets you replace a portion of your artwork to create a unique output of text and images or serial numbers. This is the variable data part of the label. We can incorporate image files submitted in various file formats. The variable data method makes simple and complex numbering possible, along with custom fields. Make all of your labels unique by entering different sets of data in each label copy. Common pieces of data include name, number, barcode, and graphics. Variable information printing (VIP) is a customizable form of variable data printing that lets one change graphics (text and images) on all variable label stickers. lets you create: Product catalogs, Template-based business cards, PDFs with web hyperlinks assigned to images, Athletic profiles with statistics, Advertisements, Reference product cards, Student or staff lists, ID cards, Unique serial number labels, Unique barcodes, 2D Data Stickers, and logo stickers. Of course, many more products benefit from the VDP process. Variable data labels are a great way to customize photos, sales messages, numbers, names, parking permits, parking passes, parking lot stickers, security permits, and product packaging for supply chain needs — make a set of labels unique and easy to identify labels no matter which industry you or your business belong to. The only limit is your imagination! At Multicolor Labels, we digital print various types of variable numbered stickers, consecutive number stickers, serialized number stickers, variable labels, and serial barcode labels. We’re here to help your company’s asset protection and identity with high quality, full-color custom variable data printing labels. We ship all over the USA and Canada, not missing out of any states including California, Texas, New York, Michigan and Florida. Contact us for more information on our custom quotes and low minimum short runs.